Once upon a time (surely >6 years ago) I made an OWL file of the taxonomy of part-whole relations , which contains several parthood relations and a few meronyic-only ones that in natural language are considered ‘part’ but are not so according to mereology (like participation, membership). Some of these relations were defined with a specific domain and range that was a DOLCE category (it could just as well have been, say, GFO). Looking at it recently, I noticed it was actually a bit scruffy (but I’ll leave it here nonetheless), and more has happened in this area over the years. So, it was time for an update on contents and on design. For the record on how it’s done and to serve, perhaps, as a comparison exercise on modeling, here’s what I did. First of all, I started over, so as to properly type the relations to DOLCE categories, with the DOLCE IRIs rather than duplicated as DOLCE-category-with-my-IRI. As DOLCE is way too big and slows down reasoning, I made a module of DOLCE, called DOLCEmini, mainly by removing the irrelevant object properties, though re-adding the SOB, APO and NAPO that’s in D18 but not in DOLCE-lite from DLP3791. This reduced the file from DOLCE-lite’s 534 axioms, 37 classes, 70 OPs, in SHI to DOLCEmini’s 388 axioms, 40 classes, 43 OPs, also in SHI, and I changed the ontology IRI to where DOLCEmini will be put online. Then I created a new ontology, PW.owl, imported DOLCEmini, added the taxonomy of part-whole relations from  right under owl:topObjectProperty, with domain and range axioms using the DOLCE categories as in the definitions, under part-whole. This was then extended with the respective inverses under whole-part, all the relevant proper part versions of them (with inverses), transitivity added for all (as the reasoner isn’t doing it ) annotations added, and then aligned to some DOLCE properties with equivalences. This makes it to 524 axioms and 79 object properties. I deprecated subquantityOf (annotated with ‘deprecated’ and subsumed by a new property ‘deprecated’). Several new stuff relations and their inverses were added (such as portions), and annotated them. This made it to the PW ontology of 574 axioms (356 logical axioms) and 92 object properties (effectively, for part-whole relations: 92 – 40 from dolce – 3 for deprecated = 49). As we made an extension with mereotopology  (and also that file wasn’t great, though did the job nevertheless ), but one that not everybody may want to put up with, yet a new file was created, PWMT. PWMT imports PW (and thus also DOLCEmini) and was extended with the main mereotopological relations from , and relevant annotations were added. I skipped property disjointness axioms, because they don’t go well with transitivity, which I assumed to be more important. This makes PWMT into one of 605 (380 logical) axioms and 103 object properties, with, effectively, for parts: 103 – 40 from dolce – 3 for deprecated – 1 connection = 59 object properties. Ah well, even if the OWL files are not used, it was still a useful exercise in design, and at least I’ll have a sample case for next year’s ontology engineering course on ‘before’ and ‘after’ about questionable implementation and (relatively) good implementation without the need to resorting to criticizing other owl files… (hey, even the good and widely used ontologies have a bunch of pitfalls, whose amount is not statistically significantly different from ontologies made by novices ). Keet, C.M. 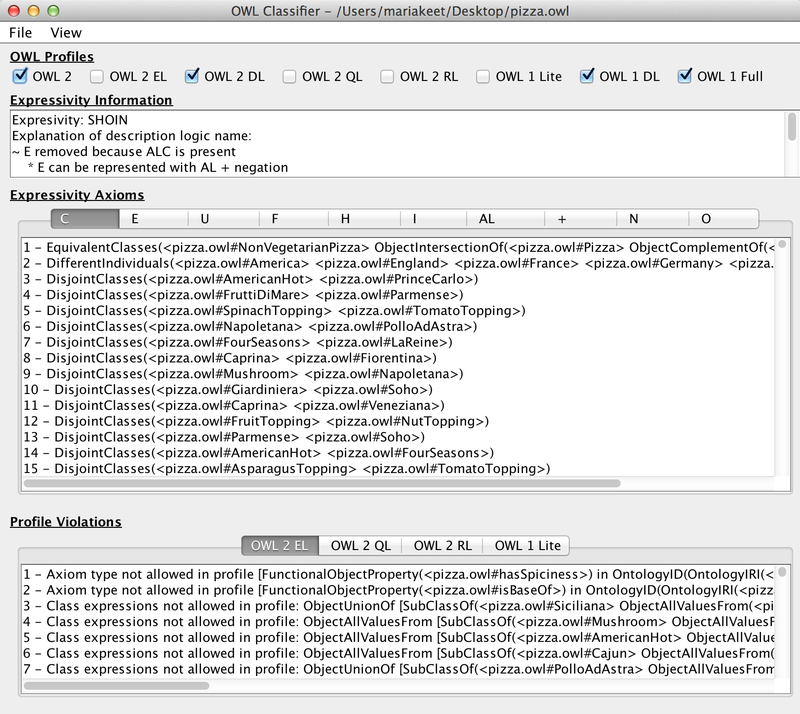 Detecting and Revising Flaws in OWL Object Property Expressions. 18th International Conference on Knowledge Engineering and Knowledge Management (EKAW’12), Oct 8-12, Galway, Ireland. Springer, LNAI 7603, 252-266. Keet, C.M., Suarez-Figueroa, M.C., Poveda-Villalon, M. Pitfalls in Ontologies and TIPS to Prevent Them. In: Knowledge Discovery, Knowledge Engineering and Knowledge Management: IC3K 2013 Selected papers. Fred, A., Dietz, J.L.G., Liu, K., Filipe, J. (Eds.). Springer, CCIS 454, pp. 115-131. 2015. Students enrolled in my ontology engineering course have to do a “mini-project” on a particular topic, chosen from a list of topics, such as on ontology quality, verbalisations, or language features, and may be theoretical or software development-oriented. In terms of papers, the most impressive result was OntoPartS that resulted in an ESWC2012 paper with the two postgraduate students , but also quite some other useful results have come out of it over the past 7 years that I’m teaching it in one form or another. This year’s top project in terms of understanding the theory, creativity to do something with it that hasn’t been done before, and working software using Semantic Web technologies was the “OWL Classifier” by Aashiq Parker, Brian Mc George, and Muhummad Patel. Strictly speaking, it isn’t in OWL 2 QL! The OWL 2 QL profile does have xsd:integer as datatype , not xsd:int, as, and I quote the standard, “the intersection of the value spaces of any set of these datatypes [including xsd:integer but not xsd:int, mk] is either empty or infinite, which is necessary to obtain the desired computational properties”. [UPDATE 24-6, thanks to Martin Rezk:] The main toolset for OWL 2 QL, Ontop, actually does support xsd:int and a few other datatypes beyond the standard (e.g. : also float and boolean). 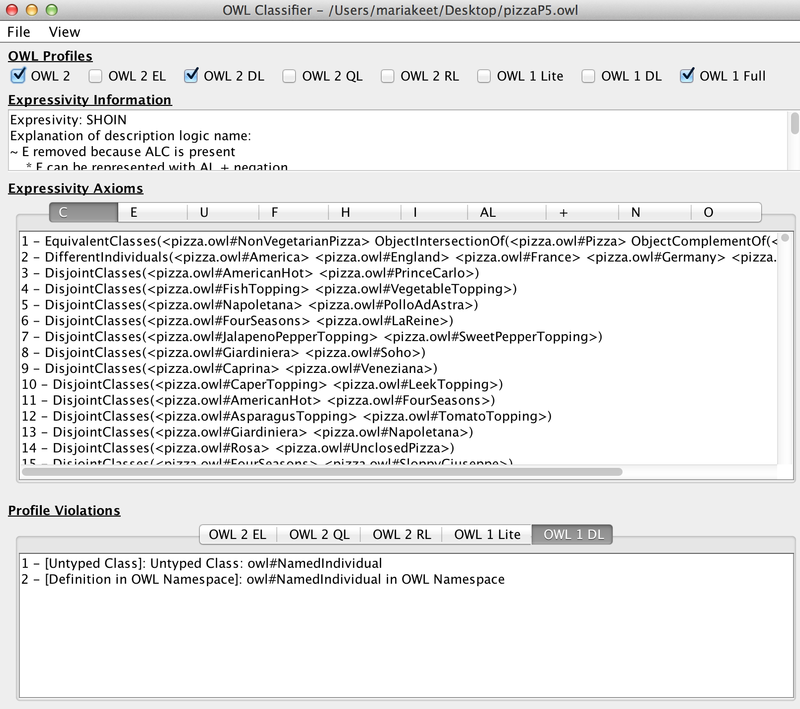 There is similar syntax fun to be had with the pizza ontology: the original one is indeed in OWL DL, but if you open the file in Protégé 5 and save it, it is not in OWL DL anymore but in OWL 2 DL, for the save operation snuck in an owl#NamedIndividual. Click on the thumbnails below to see the before-and-after in the OWL classifier. This is not an increase in expressiveness—both are in SHOIN—just syntax and tooling. The OWL Classifier can thus classify both OWL 1 and OWL 2 ontologies, which it does through a careful orchestration of two OWL APIs: v1.4.3 was the last one to support OWL 1 species checking, whereas for the OWL 2 ontologies, the latest version is used (v4.2.3). The jar file and the source code are freely available on github for anyone to use and to take further. Turning it into a Protégé plugin very likely will make at least next year’s ontology engineering students happy. Comments, questions, and suggestion are welcome! Boris Motik, Bernardo Cuenca Grau, Ian Horrocks, Zhe Wu, Achille Fokoue, Carsten Lutz, eds. OWL 2 Web Ontology Language: Profiles. W3C Recommendation, 11 December 2012 (2nd ed.). Reflections on ESWC 2016: where are the ontologies papers? Although I did make notes of the presentations I attended at the 13th Extended Semantic Web Conference a fortnight ago, with the best intentions to write a conference report, it’s going to be an opinion piece of some sort, on ontology engineering, or, more precisely: the lack thereof at ESWC2016. That there isn’t much on ontology research at ISWC over the past several years, I already knew, both from looking at the accepted papers and the grapevine, but ESWC was still known to be welcoming to ontology engineering. ESWC 2016, however, had only one “vocabularies, schemas, and ontologies” [yes, in that order] session (and one on reasoning), with only the paper by Agnieszka and me solidly in the ‘ontologies’/ontology engineering bracket, with new theory, a tool implementing it, experiments, and a methodology sketch . The other two papers were more on using ontologies, in annotating documents and in question answering. My initial thought was: “ah, hm, bummer, so ESWC also shifted focus”. There also were few ontologists at the conference, so I wondered whether the others moved on to a non-LD related field, alike I did shift focus a bit thanks/due to funded projects in adjacent fields (I did try to get funds for ontology engineering projects, though). To my surprise, however, it appeared that a whopping 27 papers had been submitted to the “vocabularies, schemas, and ontologies” track. It was just that only three had made it through the review process. Asking around a bit, the comments were sort of like when I was co-chair of the track for ESWC 2014: ‘meh’, not research (e.g., just developing a domain ontology), minor delta, need/relevance unclear. And looking again at my reviews for 2015 and 2016, in addition to those reasons: failing to consider relevant related work, or a lacking a comparison with related work (needed to demonstrate improvement), and/or some issues with the theory (formal stuff). So, are we to blame and ‘suicidal’ or become complacent and lazy? It’s not like the main problems have been solved and developing an ontology has become a piece of cake now, compared to, say, 10 years ago. And while it is somewhat tempting to do some paper/presentation bashing, I won’t go into specifics, other than that at two presentations I attended, where they did show a section of an ontology, there was even the novice error of confusing classes with instances. The aggregates are a bit ‘dirty’ as the 2010 increase grouped ontologies together with reasoning (if done for 2016, we’d have made it to 6), as was 2007 a bit flexible on that, and 2015 had 3 ontologies papers + 3 ontology matching & summarization, so stretching it a bit in that direction, as was the case in 2013. The number of papers in 2006 is indeed that much, with sessions on ontology engineering (3 papers), ontology evaluation (3), ontology alignment (5), ontology evolution (3), and ontology learning (3). So, there is indeed a somewhat downward trend. Admitted, ‘ontologies’ is over the initial hype and it probably now requires more preparation and work to come up with something sufficiently new than it was 10 years ago. Looking at the proceedings of 5 years ago rather, the 7 ontologies papers were definitely not trivial, and I still remember the one on removing redundancies , the introduction of two new matching evaluation measures and comparison with other methods , and automatically detecting related ontology versions . Five ontology papers then had new theory and some experiments, and two had extensive experiments [5,6]. 2012 had 6 ontologies papers, some interesting, but something like the ‘SKOS survey’ is a dated thing (nice, but ESWC-level?) and ISOcat isn’t great (but I’m biased here, as I don’t like it that noun classes aren’t in there, and it is hard to access). Now what? Work more/harder on ontology engineering if you don’t want to have it vanish from ESWC. That’s easier said than done, though. But I suppose it’s fair to say to not discard the ESWC venue as being ‘not an ontology venue anymore’, and instead use these six months to the deadline to work hard enough. Yet, who knows, maybe we are harder to ourselves when reviewing papers compared to other tracks. Either way, it is something to reflect upon, as an 11% acceptance rate for a track, like this year, isn’t great. ESWC16 in general had good papers and interesting discussions. While the parties don’t seem to be as big as they used to be, there sure is a good time to be had as well. p.s. : Cretan village, where I stayed for the first time, was good and had a nice short walk on the beach to the conference hotel, but beware that the mosquitos absent from Knossos Hotel all flock to that place. Stephan Grimm and Jens Wissmann. Elimination of redundancy in ontologies. In: Proceedings of the 8th Extended Semantic Web Conference (ESWC’11). Heraklion, Crete, Greece, 29 May – 2 June 2011. Springer LNCS 6643, 260-274. Xing Niu, Haofen Wang, GangWu, Guilin Qi, and Yong Yu. Evaluating the Stability and Credibility of Ontology Matching Methods. In: Proceedings of the 8th Extended Semantic Web Conference (ESWC’11). Heraklion, Crete, Greece, 29 May – 2 June 2011. Springer LNCS 6643, 275-289. Carlo Alocca. Automatic Identification of Ontology Versions Using Machine Learning Techniques. In: Proceedings of the 8th Extended Semantic Web Conference (ESWC’11). Heraklion, Crete, Greece, 29 May – 2 June 2011. Springer LNCS 6643, 275-289. Keet, C.M. The use of foundational ontologies in ontology development: an empirical assessment. In: Proceedings of the 8th Extended Semantic Web Conference (ESWC’11). Heraklion, Crete, Greece, 29 May – 2 June 2011. Springer LNCS 6643, 321-335. Wei Hu, Jianfeng Chen, Hang Zhang, and Yuzhong Qu. How Matchable Are Four Thousand Ontologies on the Semantic Web. In: Proceedings of the 8th Extended Semantic Web Conference (ESWC’11). Heraklion, Crete, Greece, 29 May – 2 June 2011. Springer LNCS 6643, 290-304.